Created in 1996, Kahurangi is one of New Zealand's newest national parks, and at 452,002 hectares it is also the second largest. Translated, its name has a number of meanings including 'treasured possession', an apt description of its wonderfully diverse natural and recreational values. Kahurangi is a geologically complex area. Much of its rock is sedimentary, laid down in an ancient sea, then faulted, uplifted and scoured, in places, by glaciers. Parts of the region are limestone or marble, these areas are characterised by an abundance of caves, bluffs, natural arches, sinkholes and water-worn outcrops. New Zealand's oldest fossil (540 million years old) was found in the park. The vegetation cover changes markedly from one side of the park to the other and from the coast to the tops of mountains. In the east, beech forest is dominant while to the west you will see podocarp forest with a rich understory of ferns, vines and shrubs. On the coast stands of nikau palms give the forest an almost tropical look. 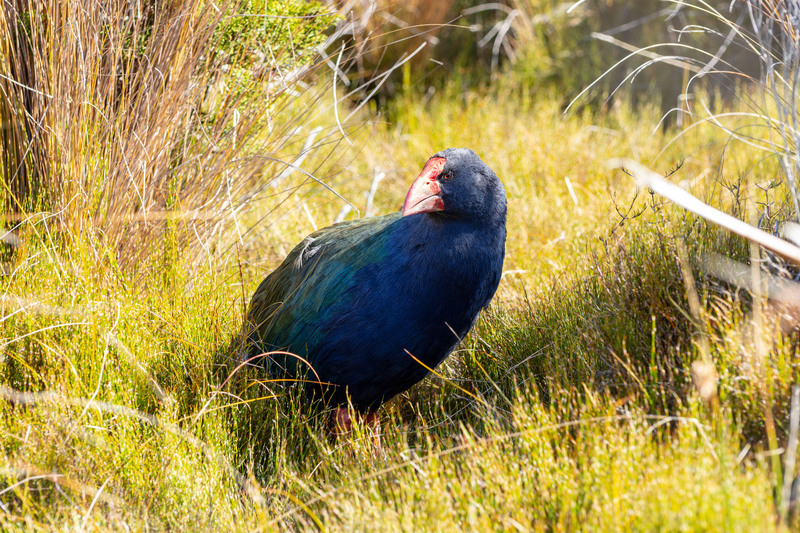 80% of New Zealand's alpine species can be found in the high reaches of the park. Due to the varied landscape numerous different habitats have been created which support many different creatures. Several threatened species survive here from the diminutive rock wren to one of New Zealand's largest birds - the great spotted kiwi. The park is home to our largest cave spider and the smallest of our giant weta - a flightless insect a bit like a grasshopper. 20 species of carnivorous land snail (Powelliphanta) live in the park; they can sometimes be seen near limestone outcrops though they tend to only come out from hiding on damp nights to feed on native worms that can grow up to a metre long. Mangarakau Swamp is relatively pristine freshwater swamp at the southern end of the Whanganui Inlet, south of Farewell Spit on the west coast. Westhaven is one of the largest and least modified estuaries in New Zealand. It was formally protected in 1994 with the creation of the Westhaven (Te Tai Tapu) Marine Reserve and the Westhaven (Whanganui Inlet) Wildlife Management Reserve. This is a magical location – to the west are tidal bays and inlets and towering limestone bluffs, and to the east the forested ranges of Kahurangi National Park. Take your binoculars as it's a great place to see wetland birds like the Australasian bitterns/matuku and fernbirds/mātā. To get there, take the road from Collingwood towards Farewell Spit. Turn left at Pakawau Inlet across to the Whanganui Inlet and then follow the road south around the eastern shoreline. There are toilets and an information centre. Parts of Kahurangi were occupied by Maori from the 14th Century and the coast was much travelled by those seeking pounamu (greenstone). In 1846 Charles Heaphy, a draughtsman with the New Zealand Company, and Thomas Brunner were the first Europeans to tramp the north west coast of the park. Later well worn packtracks were built by those wanting easy access to the Aorere goldfield, New Zealand's first gazetted goldfield. Kuhurangi National Park was a location for Dimrill Dale and the outcrop south of Rivendell in the Lord of the Rings film trilogy. Kahurangi is in the northwest corner of New Zealand's South Island. Motueka, Takaka, Karamea, Tapawera and Murchison are the park's gateway towns. Roads from all the gateway towns lead into carparks within the park and a network of tracks. There are regular bus services to Motueka, Takaka and, in summer, to the start of the Heaphy Track. The bus service through to Christchurch can also drop people at a number of access points into the park. There are also companies in most of the local towns that offer an on-demand shuttle service. If you are going to be using the track system in the park for overnight trips make sure you are properly equipped and well prepared. Check at a DOC office for latest information on weather and track conditions.